There are five days in the Hindu festival of lights called Diwali - or Tihar - as it is known by Nepalese locals. Each day celebrates a different animal and the second day of the festival, November 10th, honours dogs. 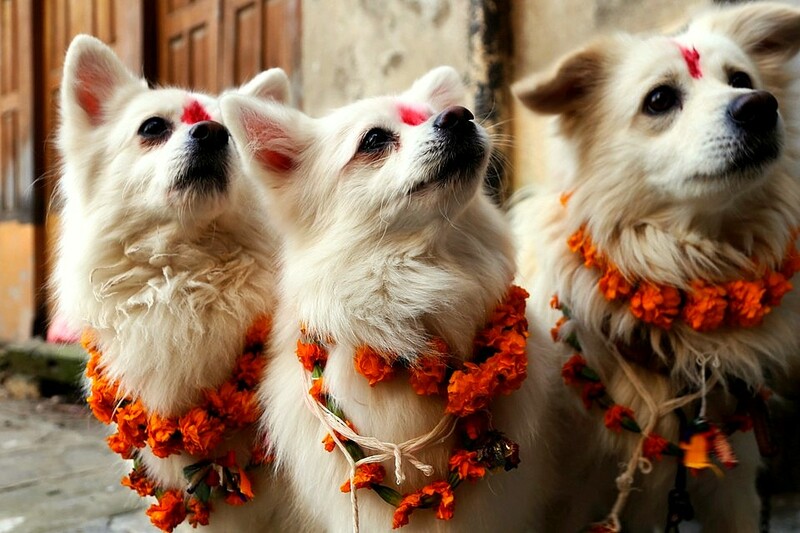 They are decorated and given a feast fit for royalty – even street dogs! The first day, Kaag Tihar (Kwah Pujā), is dedicated to crows and ravens. Their cawing represents grief and sadness. Sweets are left on rooftops for them to fend off this despair. On the third day, Gai Tihar, cows are venerated with garlands and the best grass, because they signify wealth and prosperity. Houses are cleaned and adorned with marigolds and chrysanthemums. There are other celebrations on the fourth and fifth days for oxen and for sisters to thank their brothers for the protection they provide. But the second day, Kukur Tihar is set aside for dogs, who are believed to be messengers of the Lord Yamaraj, the god of death. Yamaraj is said to have two dogs – Shyam and Sadal – who guard the entrance to hell. Dogs have long held a special place in Hindu culture. In the ancient text of the Mahabharata, the great king Yudhishthira refused to enter heaven without his devoted dog. Presumably that means that all dogs go to heaven in Hindu lore, as they should. There is a very special relationship between people and dogs in Nepal as they were one of the first domesticated animals. 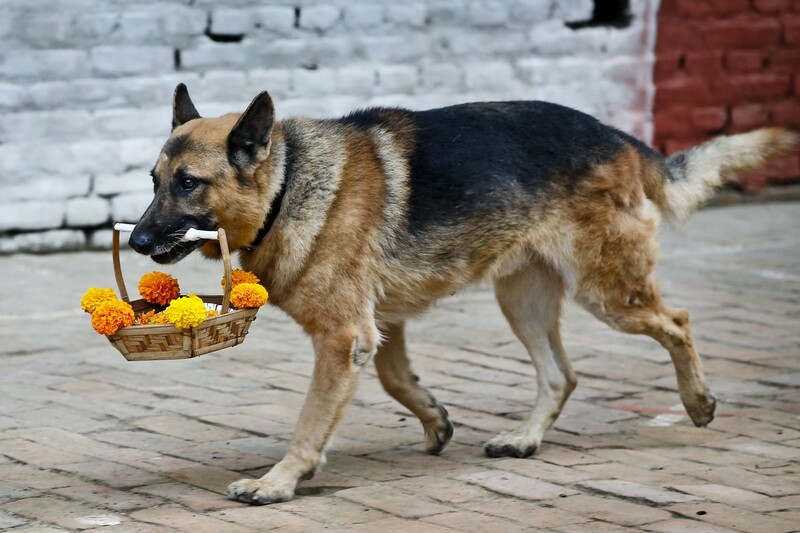 To recognise and honour dogs during Tihar, a garland of flowers is draped around the neck of every dog: pets, police canines, service animals, and strays alike. 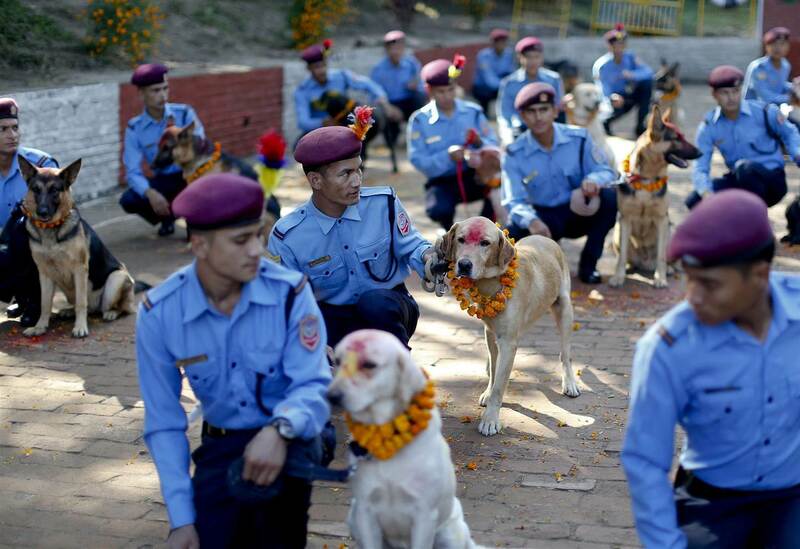 Nepalese police officers stand next to dogs at Nepal's Central Police Dog Training School during a dog worship day as part of the Tihar Festival, in Kathmandu, Nepal on Nov. 10, 2015. 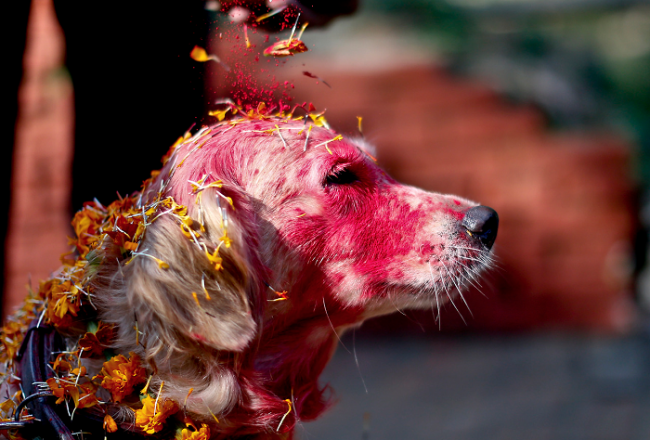 In addition to the flower necklace, each dog gets a red mark on its forehead called a tika, made from a red dye powder. The tika marks the dog as a sacred being (who is definitely allowed on the couch even with muddy paws). 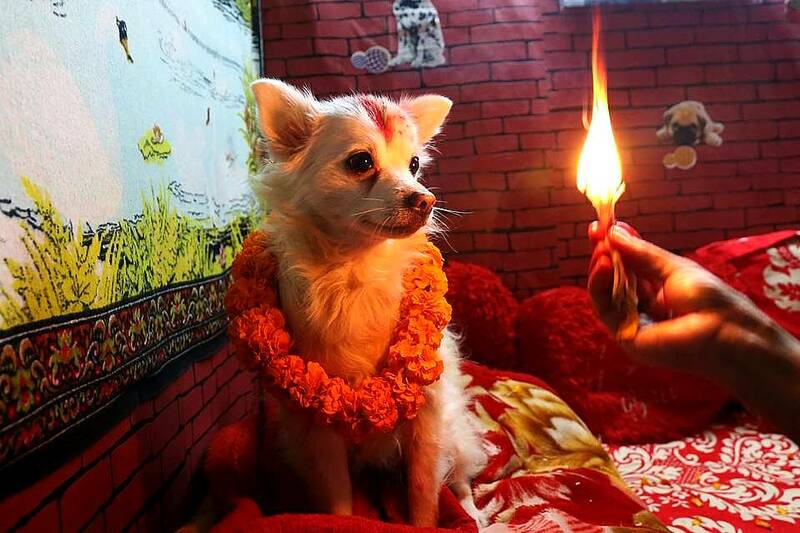 The tika also works as a way of letting dogs display their own appreciation, as this mark empowers them to bless all those they encounter on this day. 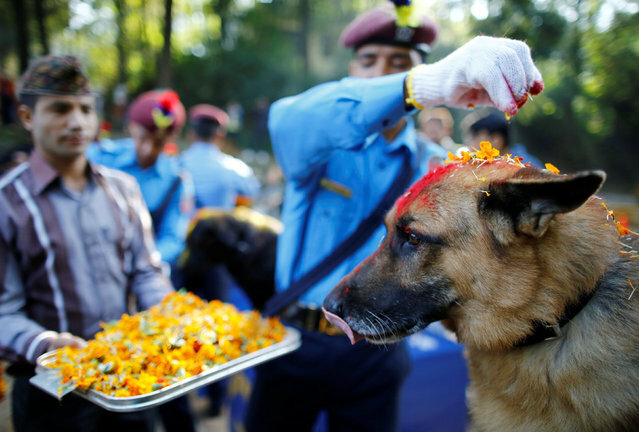 A police officer sprinkles coloured powder onto a police dog at Nepal's Central Police Dog Training School during a dog worship day as part of the Tihar Festival, in Kathmandu, Nepal, on Nov. 10, 2015. Pets and street dogs alike are blessed and pampered throughout the day and they are treated to heaps of scrumptious food. See how these dogs celebrate the day! 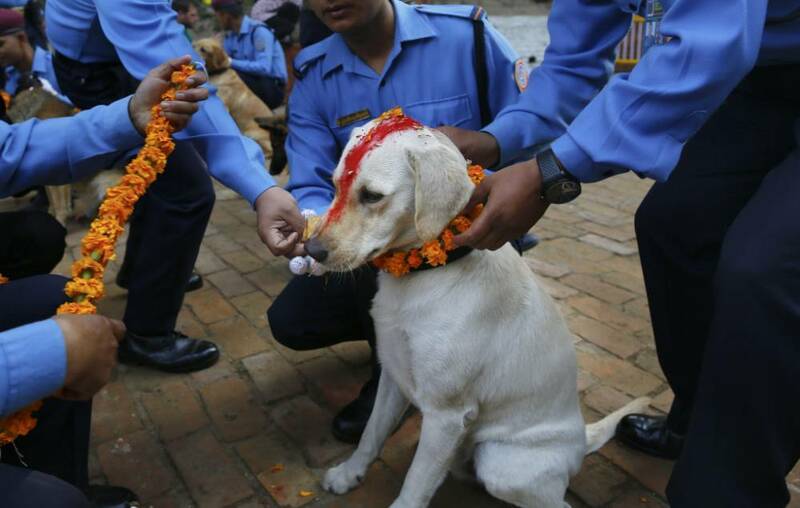 A police dog holds a flower basket at Nepal's central police dog training school, on the day dogs are worshipped.